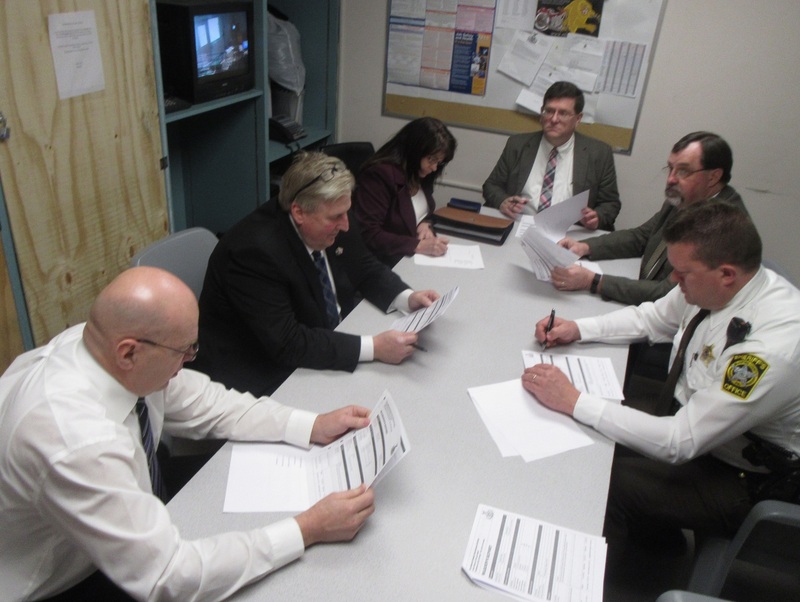 Participants in the March 14 meeting of the Bradford County Prison Board included (above, clockwise, from left) Warden Don Stewart, commissioner Doug McLinko, chief clerk Michelle Shedden, commissioners Ed Bustin and Daryl Miller, and sheriff C.J. Walters. When a person who has previously committed a crime is brought back into the prison system on a bench warrant for unpaid fines or court fees, several things can happen. If he or she is able to pay the fines, they are set free. If not, they can be put back in jail where they cannot work to pay off their fines and the prison system covers the cost of retaining them, hoping to retrieve the expenses at a later date. Bradford County Prison Board members have learned the hard way that if that person has medical issues and is sent back in jail, prison officials are obligated to put them in a hospital and get them the treatment that they need. That cost also is shouldered, in most cases, by the county. Sheriff Walters asked chief clerk Michelle Shedden last month to find out how other counties handle the problem. She related that she didn’t get a lot of response to her initial inquiry via email on the topic, but the few county clerks who responded informed her that they their counties had privatized collections, meaning that an outside company was contracted to help them get back more of what was owed to them. On a related note, commissioner Ed Bustin questioned the practice of insurance providers, including Medicaid, suspending policies of individuals on pretrial status, which also puts the burden on the county. “These people haven’t even been convicted of anything,” Bustin maintained, adding that he has reached out to the County Commissioners Association of Pennsylvania (CCAP) to see if anything can be done to change that. He also suggested that CCAP might be willing to conduct a survey of member counties to learn what solutions have been found to this rarely discussed topic. Warden Don Stewart announced the recent hiring of nine new corrections officers: Derrick Strait, David Voorees, Travis Pond, Zach Manley, Makayliegh Aston, Megan Meyer, Rhianna Nuiniskis, Tim Pearson, and Zane Hibbler. Each has been brought on board on a part-time basis with hopes that those deemed both qualified and willing can be promoted to full-time. Stewart estimated that there are now about 50 corrections officers employed at the facility in Burlington, 20 of whom are currently part-time. Stewart would like to see at least 10 more of those employees advance to full-time status. During the regular meeting of the Bradford County Commissioners that preceded last week’s prison board meeting, the commissioners approved a new contract with Teamsters Local 529 granting corrections officers a two percent raise per year for the next three years. When ask if the raise might increase retention of COs at the jail, commissioner Ed Bustin stated, “I don’t know that it’s going to make a big difference,” noting that the nominal raise was simply on par with the rest of the county. A question that Stewart is unable to answer at this time is whether the bolstering of prison staff with recent hires will allow the prison to resume the Community Work Force program, which provides small groups of laborers to help municipalities in the county with specific tasks such as preventive maintenance and cleanups. A facility shakedown was initiated at the jail in Burlington on Feb. 8 when inmate, J. Fuller was found to be in possession of a controlled substance. The facility was on full lockdown for five days while inmates P. Crispell, L. Jennings, D. Parker, M. Bostwick, J. Earl, R. Bump, S. Winters, S. Clapper, and J. Widrig were being investigated for possession of drugs. The best news presented at the meeting is that prison population has again been stabilized with no inmates being housed in other facilities. 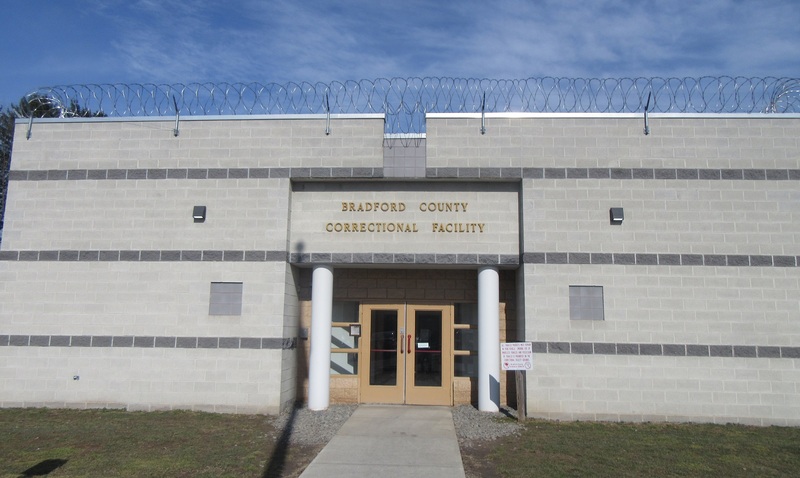 As of March 14, there were 143 males and 26 females incarcerated at the Bradford County Correctional Facility.